On Tuesday night, Theresa May’s Brexit deal was overwhelmingly rejected by the House of Commons. Mrs May’s crushing loss is the the biggest defeat inflicted on any UK government by parliament. The prime minister is now in a race against time to revamp and revive her deal before Britain’s scheduled departure from the EU on March 29. This is not going to be easy. 118 out of 317 Conservative MPs voted against the deal, showing the depth of the Conservative rebellion which Mrs. May faces. The Labour leader, Jeremy Corbyn, immediately tabled a vote of no confidence in the government. He said the defeat of the deal had been “absolutely decisive”. Theresa May survived this confidence vote by a margin of just 19 votes. She has her fellow Conservatives and the Democratic Unionists (DUP) ¬– the Northern Irish party that supports the prime minister in big votes – to thank. Neither party wants a general election. 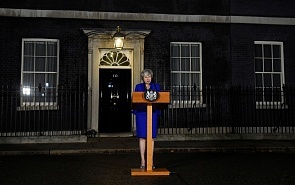 Theresa May responded to the result by saying it was “back to business as usual”. But nothing is usual about the current business of government. Nobody really knows where the Brexit negotiations go from here. Cross-party talks are underway to try to work out a new deal. On Wednesday, Mrs May held talks with the Liberal Democrats, Plaid Cymru and the Scottish Nationalists (SNP). Yesterday, after seeing off a bid to remove her government from power, she had talks with the DUP and Conservative rebels. But so far, Jeremy Corbyn has refused to meet with Mrs May. Without Labour’s support, the chances of the prime minister brokering a deal that will pass the next meaningful vote in the House of Commons, this coming Monday, is all but impossible. We are in Brexit paralysis. Nothing can move any which way. For now, at least. But it is worth bearing in mind that by the evening of March 29, one of three things that currently seems impossible, needs to happen. First, that a new withdrawal deal gets passed by parliament. Second, the government decides to pursue a ‘no deal’ Brexit, and this course of action is not stopped by the House of Commons. Or, thirdly, Article 50 needs to be extended or revoked by the government, so that Brexit is delayed or stopped altogether. The least unlikely option is the first: a new deal is agreed. The reason for this is simple. As we get closer to the March 29, it will become ever-clearer that the House of Commons is finding ways to stop a no deal. The sizeable majority of MPs are dead against this happening. Most of the opposition do not want the chaos of a ‘hard Brexit’. Most of the government do not want Brexit stopped for good, by forcing Theresa May to revoke Article 50. But just because a deal is the least unlikely option, it is still hard to see what kind of agreement can be negotiated over the next ten weeks. There is little confidence that Mrs May has the skills to forge a cross-party compromise in time. She needs to win 116 new votes – assuming that she manages to keep all the votes she already has – to guide a new deal though the Commons. The only thing anyone can be 100% sure about is that there will be more Brexit drama and instability in the coming days and weeks. Theresa May survived yesterday’s no-confidence vote in her government by a slender margin. In British politics, there is no rule about how many confidence votes can be brought against the government. Jeremy Corbyn has suggested he will keep tabling votes of no-confidence until one of them sticks. As Theresa May is forced to make difficult concessions in her bid to get a deal through parliament, she is going to face increasing unrest from within her own party. Labour’s hope is that at some point they will get enough support from disaffected Conservative rebels and the DUP to bring down May’s government and force a general election, which Labour would then be expected to win by a landslide. Currently, this feels like wishful thinking from Labour. But the closer we get to ‘no deal’ happening by default, a leading Conservative party figure is quoted as saying to the BBC that “all hell will break loose”. Amid all of this political drama and uncertainty, there is one sign of calm. The markets responded to Mrs May’s defeat on Tuesday with a collective shrug of the shoulders. There has been little movement in the FTSE 100 index. This seems to suggest that despite all the gloomy predictions and protestations coming from the House of Commons, the prospect of a ‘no deal’ on Brexit has diminished.